2. Mix flour, sugar and salt in saucepan. 3. Combine beaten egg yolks and milk; stir mixing well. 4. Add in flour mixture and blend well. 5. Cook over medium heat, stirring constantly until thickened and smooth. 6. Remove from heat and add 1 tsp. vanilla. 7. Place a layer of vanilla wafers in bottom of a large baking dish. 8. Add a layer of sliced bananas over wafers. 9. Top with cooked custard mixture. Repeat layers as needed. 10.To make meringue, beat egg white slightly. 11. Gradually add 1/4 cup sugar (or to taste). 12. Beat until stiff. Add in 1 tsp. vanilla. 13. 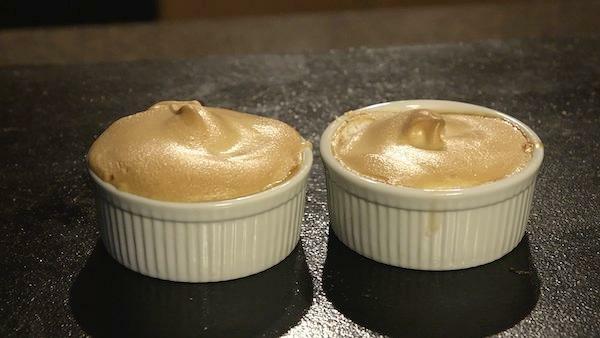 Spread meringue over pudding. 14. Bake until golden brown. Serve.